Once Sion is finally defeated, you get to battle the last member of the Sith Triumvirate: Darth Traya herself. Even if she only has 38m health, which means she’s a lot squishier than the two previous bosses, phase 3 is still by far the most painful and annoying part of the Sith Raid. With stacking speed, tenacity, offense, plus an undispellable isolate and unavoidable AoE damage every turn (bonds of weakness), Traya is already quite a pain to fight on her own. Add to that 3 sabers that can’t be debuffed and will inflict a debuff depending on which random buff they have, which changes every time Traya takes a turn, and you can see why p3 is going to be so annoying to deal with. To fight that phase, you’re going to need either a team that deals quick and high damage, or a team that can sustain the damage taken from Traya, her sabers, and the bonds of weakness. You have access to one raid specific ability (Stand Alone), limited to 1 use per character for the whole run, that will make them face Traya alone while gaining a portion of the stats of all allies based on their respective roles. The team comp is CLS(L), Han Solo, Pao, Death Trooper, and Chirrut Îmwe. Chirrut can be replaced by Chewbacca if you have unlocked and geared him. The strategy is quite simple: kill a saber, use offense up from Pao, use Deathmark on Traya, and then use Stand Alone on Han Solo. He will counter on Traya (Deathmark will also redirect counters from saber attacks to Traya) and deal a lot of damage as the team is full of attackers (he will gain 100% of their offense for the duration of the stand alone). 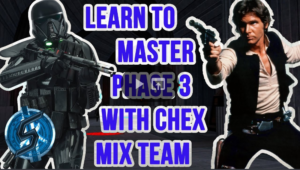 For a closer look into the mechanics of the most effective Chex Mix team for the Sith Triumvirate Raid in Phase 3, check out the article on Gaming-fans.com. 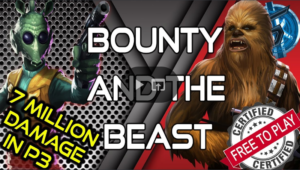 Bounty and the Beast – This is another popular team for phase 3. The idea is the same, except that you replace Han with Greedo (and CLS with Boba for more damage – bonus crit damage in leader ability). The team comp is Boba(L), Greedo, Chewbacca, Pao and Deathtrooper. Kill a Lightsaber, use offense up, apply Deathmark, and then use Stand Alone with Greedo. This team can score very high, as Greedo might get super lucky and use dozens of basics in a row (50% chance to basic again whenever he crits). Bounty Hunters with Aurra Sing – Another team that works very well in phase 3 of the Sith raid is a BH team using Aurra Sing as the leader. The full lineup is Aurra(L) Embo Dengar Nest +1 (Zam, Jango…). Nest is here to take all the isolates. Her protection up gain can’t be prevented, so she can tank for the duration of the whole run. 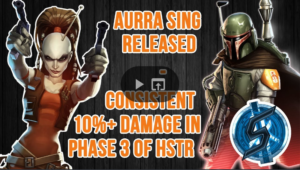 For a deep dive into the mechanics of the Aurra Sing Bounty Hunter team for Phase 3 of the HSTR, check out the breakdown written by Skelturix for Gaming-fans.com and accompanying video. Deathstorm – One last team that heavily relies on RNG, but can score really super high, is the Nightsister faction. Using a zeta’ed Talzin leader, assuming that you have both Asajj’s and Daka’s unique zeta’ed, you can score well over 10m in heroic phase 3. The full lineup is Talzin(L) Asajj Daka Zombie and Initiate. The strategy is quite simple: get Talzin and Initiate to die as fast as possible. Then spam basics during topples, and use AoEs to take down sabers (careful to avoid using basics, a basic that kills the target will revive whoever got called to assist). There are a couple of other teams that can work in phase 3, although they’ve not been mentioned in detail here. Imperial Troopers using Range Trooper can be quite effective as can a Jedi team led by Revan, which has the potential to do about 15% of phase 3 in the Heroic Sith Triumvirate Raid.